and then there are tints, tones and shades to choose from...aaahhhh! Forget about the colour wheel and just have fun mixing your own colour palette? Inspiration is all around you. All you need to do is pick up your camera, take some close-up pics and then use those image colours to create your own colour palette of not more than 6 colours. Take photos of nature, just like Jessica from Design Seeds does. 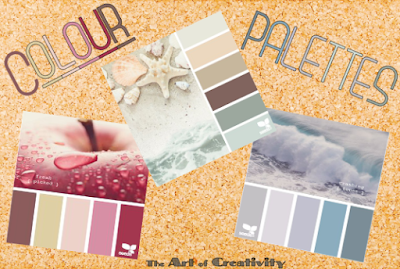 Jessica has hundreds of palettes for any and all your projects, which she gladly shares for free. These are just a few of my favourite colour palettes from Design Seeds, which I can't wait to go and incorporate into some mixed media.